The initial splash took place on Sunday 26 April 1891, with half-page ads in at least three San Francisco newspapers: the Chronicle, the Call, and the Examiner. This ad contains a reproduction of the original homestead map of Sunnyside. Half-page ad. SF Chronicle, 26 Apr 1891. Half-page splash ad. SF Call, 26 Apr 1891. SF Examiner 26 Apr 1891. 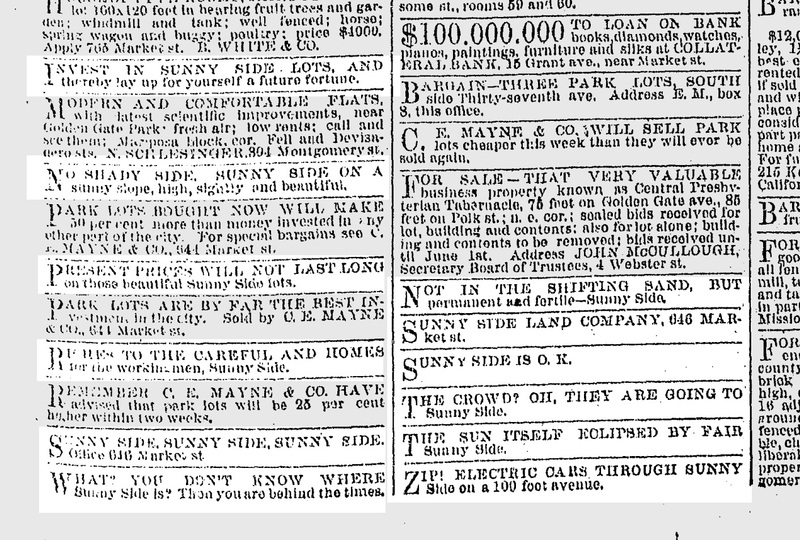 This was followed by a campaign that included long narrow columns like these, and classified ad pages peppered throughout with references to Sunnyside, many of them inane. SF Chronicle, 3 May 1891. Because nothing sells quite like doggerel. SF Call, 3 May 1891. View larger. A sprinkling of classified ads, SF Chronicle, 26 May 1891. View larger. SF Chronicle, 28 Jul 1891. SF Chronicle, 23 Jul 1891. SF Chronicle, 17 Jul 1891. More scattered classifieds — random, odd, not very informational. SF Chronicle, 19 Jul 1891. View larger. SF Chronicle, 20 Dec 1891. SF Chronicle, 20 Sep 1892. SF Chronicle. 21 May 1893. Real event to start construction of the Sunnyside Powerhouse. SF Chronicle, 18 Sep 1891. The last word-rich advertisement for Sunnyside, one year after debut. SF Chronicle, 1 May 1892. Slipping in to madness now. SF Call, 8 May 1891. More fluids! SF Examiner, 10 Apr 1892.